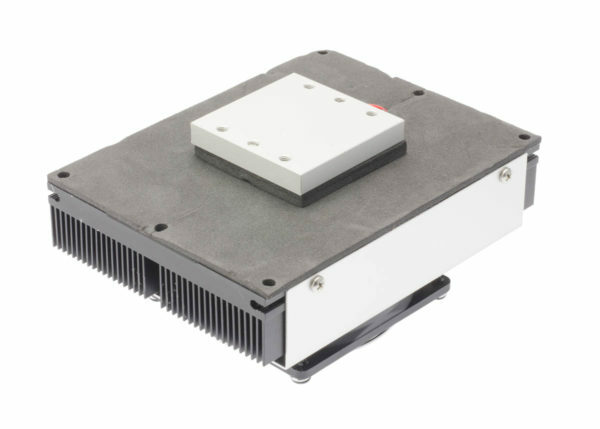 The DA PowerCool Series is a Direct-to-Air Thermoelectric Assembly (TEA) that uses impingement flow to transfer heat. It offers dependable, compact performance by cooling objects via conduction. Heat is absorbed through a cold plate and dissipated thru a high density heat exchanger equipped with an air ducted shroud and brand name fan. The heat pumping action is generated by thermoelectric modules, which are custom designed to achieve a high coefficient of performance (COP) to minimize power consumption. This product series is available in a wide range of cooling capacities and voltages. Custom configurations are available, however, MOQ applies.